I’m on the home run – I think – with my first non-fiction book Soul Friend: the story of a shared spiritual journey, due for release in October by Even Before Publishing. A few days ago, the first layout version of the book arrived for me to check through and to get someone else to proofread as well. Now I know from past experience with my previous books how essential this meticulous proofreading is. But each time, I find such experiences somewhat disconcerting. As I discover this little mistake and that little oversight, I ask myself how these could ever have escaped my attention – as well as the attention of my two manuscript readers/editors – during our numerous checks prior to this. They seem so obvious now. Admittedly, some always tend to creep in during the editing process – as one thing is changed, so another is affected without noticing. And sometimes things happen as the manuscript is imported into a different program. But I know they will be there – I don’t assume anything with my work these days. This time around, however, my experience has been even more interesting in that each day this week we have minded our five-month-old grandson. Can you picture him sitting on my lap, a little unhappy for some reason or another, reaching out his cute little hands towards my keyboard? Can you imagine my attempts to type sensible comments with one hand, while holding him firmly with the other? Nevertheless, I have now succeeded in finishing it. Yet I am left with this weird feeling inside. Are there other mistakes I should have noticed? Are there more clumsy sentences I should have changed, even at this late stage? Have I acknowledged everything I should have acknowledged? Does the book do my lovely spiritual mentor justice? 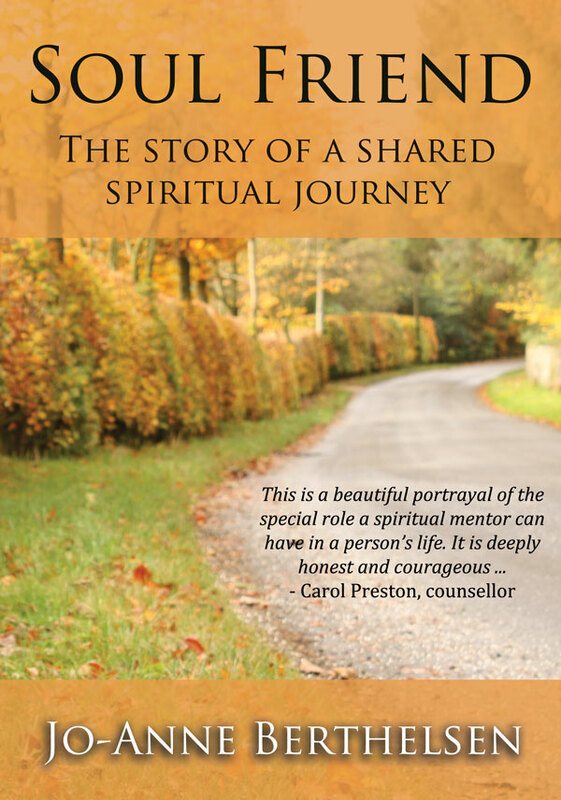 After all, this book is about the spiritual journey I have enjoyed with her over the past fifteen years – it reflects on her as well as on me. And then as I reach for my Bible in order to sit in the sun and let God’s Word minister to me, even before I open it, I am reminded again of God’s amazing grace. God has been right beside me, through all the challenges of this week. And right now, God is saying a wonderful ‘Well done’ to me at another task completed to the best of my ability. There are no hidden mistakes with God. God sees. God knows. God loves. God forgives. I still find that so amazing and freeing – and I pray with all my heart you do too. I wonder how important the cover is to you when choosing a book. If the book is by one of your favourite authors, perhaps you go ahead and buy it anyway, irrespective of the cover. Or perhaps if the title sounds interesting, that’s all you will notice. Or maybe someone you trust has recommended you buy the book – in which case the cover is pretty irrelevant yet again. Recently, I played a part in creating the cover of my first work of non-fiction entitled Soul Friend: the story of a shared spiritual journey. Now I had certain ideas I felt might work to convey the main concept of the book. I even found possible images on the net that I thought might be suitable. And my publisher listened and took these into account. But there was also quite a bit of ‘to-ing and fro-ing’ involved, as we asked ourselves lots of questions and negotiated our way towards an agreement. Does the cover give a clear sense of the content of the book? Will the image we have chosen appeal to all ages or does it look too old-fashioned? Is it eye-catching enough? Does the main colour of the cover contrast enough with my other books? Is the title in the correct place on the cover? Does it stand out enough? Have we used the best font for this? Should there be an endorsement on the cover as well as a sub-title? All these decisions – just over the cover! Yet what about the contents? What if the book doesn’t live up to that cover? How many times have you bought a book and started reading, only to find it does not capture your interest and leaves you feeling somewhat disappointed and disgruntled? You know, in the midst of this whole process of deciding on my latest book cover, it occurred to me to wonder if I go through the same process at times in my own life. I might be somewhere where I am not already known, perhaps speaking in a strange place – so what ‘cover’ will I choose? What image should I present? How relaxed and ‘myself’ can I afford to be in this environment? But even broader than that, what about my life in general? Is there an image I like to present to those around me that does not line up with what’s actually happening in my heart and soul and mind? How authentic is my life really? How authentic is my relationship with God? Does it stack up when that cover is opened and people turn the pages? Now then, you Pharisees clean the outside of the cup and dish, but inside you are full of greed and wickedness. You foolish people! Did not the one who made the outside make the inside also? It’s no use trying to pretend to God, he was reminding those present. God sees beyond that outward image and right into our hearts. And I’m glad of that. I want what I appear to be on the outside to match what’s on the inside, don’t you? I want people to open that ‘cover’ and not be disappointed or put off God as a result of who I really am and how I live my life each day. How about you? Is that your desire, too? We have a very cute grandson. He is five months old now and has reached the stage of making interesting noises when you smile and talk to him. He has his own little language and loves it if you repeat the sounds he makes to him. One day last week, I caught our daughter trying to teach him to say ‘Mum, Mum’. She’s hoping to get in quick, before he decides to say ‘Dadda’ first! How anxious we are to hear those first words from our children and grandchildren! It’s like they are real little people then, able to communicate with us on another level. At the same time as my daughter was trying to get our grandson to say his first ‘words’, however, I was busy editing my two latest books. With the shorter of the two, I dispensed with over five thousand words. With the longer book, so far, over seven thousand words have wafted off into cyberspace somewhere. And that’s even after many previous edits. Now the irony of this situation soon struck me. Here was my daughter, trying hard for that very first real word from our Zain, while I, on the other hand, was wishing I had not been so verbose! It reminded me of a time years ago when I was speaking regularly in our church. I felt then that God warned me not to get up and speak until the words I planned to say were burned into my own spirit. I felt God was pointing out I had no right to say things that were not true in my own experience and that I was not putting into practice myself. I am still glad of that strong warning today, as I prepare to speak somewhere and even as I write these blogs. No, my words are not often ‘few’, I have to admit, so in saying or writing the ‘many’, I know I need to be even more careful to honour God through them all. I wonder how long it is since you have signed an important document or agreement of some description. Perhaps it was in the process of purchasing something big – like a house or a car. Perhaps it was that agreement to pay back to the bank the money they were kindly lending you. Did you feel as if you were signing your life away? Perhaps it was those certificates you signed on your wedding day. Or perhaps it was an agreement at a hospital, consenting to a particular procedure you were about to have. How did you feel when you were putting your signature on those important documents? Last week, I found myself signing two important documents once again – two more book contracts, this time with a different publisher. One was for my first non-fiction book, Two are better than one: the story of a spiritual friendship, which describes my own journey over the past fifteen years or so with my very faithful spiritual mentor and friend Joy. The other was for my sixth novel, The Inheritance, which focuses on the theme of forgiveness and highlights the truth of Hebrews 12:15: See to it that no one misses the grace of God and that no bitter root grows up to cause trouble and defile many. Now I was very happy to sign both these contracts. I love my sixth novel – I feel I have been a little more adventurous in the way I have gone about writing it and I love the characters as well. As for my non-fiction book, while I feel quite nervous about having many of my inner struggles of the past few years made public, I believe in this book and hope and pray it inspires others. Yet in both cases, I found myself hesitating for a few seconds before signing on the dotted line. You see, signing these contracts means I commit myself to see these books through to publication and beyond. For starters, it means I am declaring these books are all my own work – and that I will deliver these completed works by the dates specified. But more than that, it means I agree to cooperate to the best of my ability with my publisher throughout the whole process and to do my utmost after publication to promote my books well. Now in return, my publisher also has to sign and agree to certain terms, such as delivering the finished product within a particular time frame and paying any royalties due. So we both commit ourselves to keep our end of the bargain and to work well together in the process. All of which has made me reflect on the biggest commitment of my life – my commitment to love the Lord with all my heart, soul, mind and strength and to follow him forever. While these other documents we might sign or contracts we might agree to are important, nothing could ever be as important as our commitment to God. God’s commitment to us was made abundantly clear through the death of Jesus Christ, an act of love above all other. While we were still sinners, far away from God, Romans 5:8 tells us, in love, Christ died for us. I chose to sign my life away to God many years ago and am so thankful for that. But right now, how am I doing as far as being true to this greatest commitment of all is concerned? Could this be a question you might ask yourself too?